How important is recycling? This question was addressed by Mike Biddle, the US based founder of MBA Polymers Inc. at the IERC Congress in Salzburg. 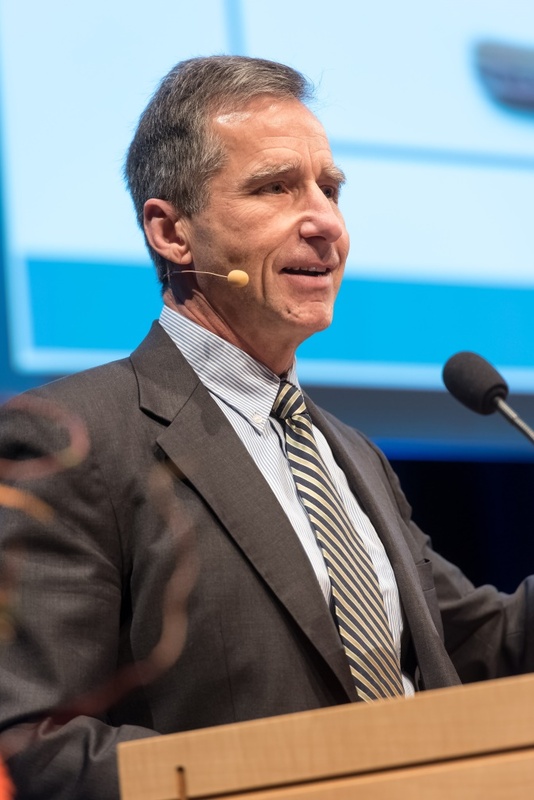 The co-founder of MBA Polymers Austria plant in Kematen / Ybbs a joint-venture with Müller-Guttenbrunn, gave a key-note speech as opening address entitled „Mining the Past to Preserve the Future“, which showed how important recycling is in view of the environmental challenges of today. It is already five to twelve in many respects! Currently, the “world-doomsday-watch” of one sciences magazine shows that it only is two and a half minutes before midnight. Alarming numbers of lost species, increase of global warming, sea-level rise, unequally distributed prosperity, and much more illustrate that there is no time to lose to take both small and big steps. 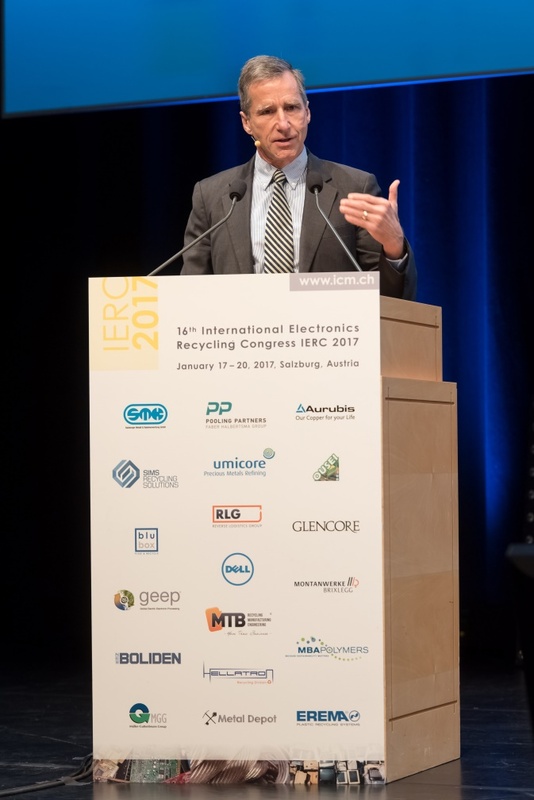 A key step in this direction will be the encouragement and promotion of recycling – not in the least as some important raw materials are becoming scarce. The natural reserves of gold, silver, zinc, lead and copper are estimated to be consumed within the next 60 years. More pessimistic estimates even mention periods of as little as 20 years! The fact that the recycling of such raw materials is important has already been recognized by Müller-Guttenbrunn and other metal recycling companies decades ago. „Urban mining“ is not only an ecological necessity, but is also economically viable. An example: for the production of aluminium from recycling, 95 percent less energy is required compared to the extraction of bauxite ore and the subsequent production of virgin aluminium. A similar picture can be seen with plastics. The production of plastic from primary raw materials requires considerably more energy and is accordingly cost-intensive. This had been recognized early on by the revolutionary spirit Mike Biddle and he converted plastic recycling into a profitable business model. One reason for this is that the consumption of plastics has multiplied several times over the past half a century. In the meantime, the recycling rate has also grown rapidly, but the gap between the total consumption of plastics and the recycled quantity is still growing further and further apart. The recycling of plastics can contribute hugely to environmental protection. Virgin plastics require many complex industrial processes and long distances need to be covered: oil must be extracted from the earth, transported to and refined by complex refineries. Subsequently the refined monomers are further processed into polymers in energy-consuming processes which require a great deal of water. It is therefore not surprising that both the energy consumption and the water consumption is more than 90% lower for Post-Consumer Recycled plastics compared the production of virgin plastics. Plastic recycling also reduces a great deal of CO2 emissions. Mike Biddle explained this with a remarkable comparison, which he also gave a personal touch. He initially compared the savings in CO2 emissions from large companies such as Unilever and Coca-Cola to those of his own family. Large corporations, with their corporate responsibility activities, were able to save one or two tonnes per head (employee) and per year. Mike Biddle and his family reduced the CO2 emissions per person by five tons per year with only four simple changes in their living habits. And lastly Mike Biddle compared this to plastics recycling. The American illustrated how valuable plastic recycling is with the fact that each individual MBA Polymers employee contributes to a saving 900 Metric Tons of CO2 emissions and this per year. For the entire Müller-Guttenbrunn Group, an even higher saving per employee is achieved. The extraction and production of new raw materials always require a high level of energy input. In many cases enormous emissions are also caused by these processes. Compared to the production of virgin raw materials, recycling processes offer enormous savings potentials, as this table below illustrates.